"Unemployment has hit baby-boomers especially hard. For those over 55, the jobless rate has doubled since the recession began, to 6.8 percent. In real terms, that's more than 2 million people..." (cbs evening news 6/13/11). And as reported in early February, 2013 by the New York Times, "Over the last year, the average duration of unemployment for older people was 53 weeks, compared with 19 weeks for teenagers, according to the Labor Department report released Friday (2/1/13)." Although this comes as no surprise to our fellow Boomers, it seems to continually amaze the kids in the generations beneath us, who think our continued presence in the workforce is stealing jobs from them (we're not... our talents, knowledge, and skill-sets are highly developed, so we're in jobs for which youngsters would not yet qualify). When you interview, no doubt you will encounter a few barriers to being an older worker. The problem is most are based on old information & 20th century models, not our reality. Penn State health policy and administration professor Diane Spokus exposed the two most damaging myths surrounding older workers left over from the last century therefore based on a very different economic environment, and a generation now long retired with a huge labor force following in their footsteps (Boomers). Today’s older workers have fewer acute illnesses (not to mention sports injuries), while younger workers also have more dependents. So in reality, overall benefits may work out to be the same for older and younger workers. So, don't let the uninformed (and usually much younger) hiring personnel get you down. Go into the interview supported by the facts about us as employees - it will help both your bruised self-image and, ultimately, their bottom line. You aren't saving time; you're wasting everyone's time. Every application has to be customized to the company. When you haven't read each application's requirements fully, for example, job ads that request a statement on your commitment to diversity, you can very likely miss an important factor - and the applications missing that sample response will go directly to the prospective employer's delete file. Do your homework before sending out an e-mail. Research the company on its web site and on blogs to see what people are saying about it. Do you really want to work there? Is there a particular skill, experience or knowledge you have that ties directly to the business strategy? Give them something about yourself that relates to what they do. In the old days, résumés had to be printed and couldn't be changed. Today, you can and must personalize each résumé and each cover letter. First, don't list your jobs in chronological order (and whether you want to leave out dates is up to you) - instead list them by type of experience (senior management, consulting, etc.). Then, give just a brief explanation of the company and job duties, followed by your accomplishments/achievements (increased productivity by 50%) - an employer doesn't want your job description ("responsible for staff supervision"), they want to know your value. Finally, include only positions and activities that are relevant to this position and to the world today. So if you spent five years selling predatory home loans, you don't need to include that. But if you spent five years on the board of a nonprofit foundation or doing community service, don't forget to include that. It shows leadership, values and commitment, which is something companies prize. Of course, if you aren't using social media such as Twitter, Facebook and LinkedIn, you need to learn how and start doing it right away. But do not falsely represent yourself as a social-media expert, which is very desirable these days, if you don't know how to tweet. It doesn’t matter that you used to earn six figures and have a big mortgage; that isn't a prospective employers' problem. Even though you have decades of experience, you know employers are easily able to find someone younger and much cheaper to do the same job (that’s one of our big problems, in fact). The way around that is to suggest other forms of meaningful compensation that you’re willing to accept in lieu of higher pay, like a flexible work schedule, days working from home, or other non-monetary benefits that are useful to you but won’t cost the company. It doesn't denigrate your value, and actually shows what an asset you can be. Many of our talents & capacities can fit in a variety of industries; it's up to you to demonstrate that. Find new, growing industries (healthcare comes to mind, thanks to the demand from....us), and show how your background & experience will fit beautifully with that employer's needs. The homework on the hiring entity recommended above can include any problems that industry has been experiencing along with the research you do on the business itself. Between the two, you come to the table with a formidable presentation. When you're between full-time jobs, you can keep your skills fresh and at least some of your bills paid with P/T, Temp, or contract employment. 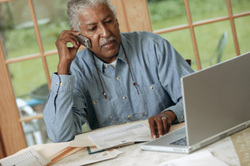 This free internet job site provides quality employment opportunities and resources targeted to Baby Boomers, with a variety of jobs for older workers. Wiser Worker also features an excellent resource center for both employers and job seekers. JobsOver50 is "a free web-based employment service for Baby Boomers & Retirees." They understand the employment needs of 50+ job seekers and built a uniquely powerful job-service portal to support us. The services at RetirementJobs are free for job seekers, and great for those seeking part-time employment (thus the name...). They provide the option of upgrading to a premium service (starts at $4.95/mo - quite reasonable) that gives access to seminars and special content, and enables job seekers to easily identify job openings from employers certified or pre-certified as age friendly (see below). Senior Bank - another site that brings together employers with older job seekers. Seniors 4 Hire lists jobs and other ideas for earning money. Workforce 50 Besides age-appropriate career content, from resume writing to job search strategies. they also have a career and education section to assist Boomers who are considering a career or job transition. Retired Brains information for both a job search and starting your own business. Reboot You articles and resources to help you find a new career after ending your current one. _RetirementJobs.com has created a Certified Age Friendly Employer program for employers proven to be friendly to mature workers. They receive a certification that indicates the company scores highly in factors like older-friendly hiring practices, compensation and benefits programs, training opportunities, and work-day flexibility (hours and days an employee can work to accommodate a work-life balance). The list includes Citizens Financial Group; the Transportation Security Administration; The Fresh Market; H&R Block; and Robert Half International. Go to the retirementjobs.com website for the complete list.